Sci-Fi Radio from 1989 was an anthology of magazine short story adaptations, with a pretty good choice of the stories. 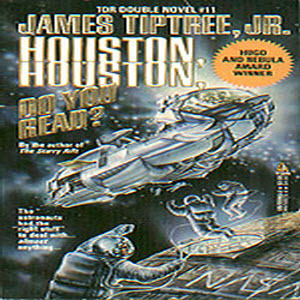 A favorite of many was "Houston, Houston, Do You Read", by James Tiptree, Jr. The series consisted of 26 weekly half-hour shows produced by Kevin Singer. Acting is usually stiff, which distracts from the stories, but the production is very well done and listenable on radio. Aired on NPR playhouse and other stations. Following is a list of the plays included in the series and the author of the original story. * Yanque Doodle, James Tiptree, Jr.
* Houston, Houston, Do You Read? *, James Tiptree, Jr. These were recorded off the radio and vary in quality. Thanks for this, I'm really looking forward to listening to them all. Just a small point about the zip file. Its 22nd file is "Sci Fi Radio.zip" - which contains the 21 files all over again. So the file in the link is twice the size it should be.